It feels like another time. Not just because of unseasonable weather that defies the groundhog’s claim there would be an extended winter, but because the Meadowlands is the sole platform over the weekend for the sport’s highlight events. We can all thank our St. Patrick’s Day lucky stars for Jeff Gural and company, for making the Meadowlands thrive as a private enterprise after a political debacle. Three-year-old-plus trotters get rolling in the Horse & Groom, soph-filly trotters surface for their first big-money test in the Syrinx Hanover and three- and four-year-old filly and mare pacers grace the Night Styles. And that is just on Friday, March 16. On Saturday, March 17, when everyone becomes Irish, so to speak, the Four Leaf Clover Final partners with the Overbid Final on the holiday program. Although no features are focused upon at Woodbine, players on TwinSpires continue to collect TSC Elite points at the rate of 10X with successful $10 win tickets. Friday’s three features include four races: the $82,000 Horse & Groom and $37,000 Syrinx Hanover finals and two adventures of the Night Styles. The Horse & Groom Final presents a good chance for an upset with the 10 horse, Ice Machine. Now conditioned by Walter Carroll and introduced to Yannick Gingras in the sulky this evening, last year’s top soph-colt trotter in the early season shows all signs of maturity. Having won the first leg of this event and then burdened with post 10 last week, Ice Machine demands respect here. Last week’s mile was more like he won at three, storming late from behind. He gained 2 lengths to be fourth. If you gauge his win the week before that you see he is capable of a brush that can overcome the outside start. In Canada’s Don Mills events last month he faced far tougher than these foes. We expect this four-year-old season to be huge for Ice Machine. Barring any unforeseen circumstances, veteran owner Robert Key may be looking at a big bankroll in the older division of trotters, rich with events throughout the season. The Syrinx Hanover displays glamour-girl-division trotters in a conditioned event that may or may not involve heroines of the season. The steadily unreliable gait of these gals is cause for some alarm but add to that the choices getting the outside posts here and it shouldn’t surprise anyone if this turns into a steeplechase. That being said, we like the chances of After Midnight. After Midnight leaves from post 7 with her main rivals farther outside of her. She has speed and last week tried to use it early, getting the lead and being caught late by ½ length to get the third spot. All signs lead to her being the third choice but worth that price and maybe less. The second leg of the Night Styles contest offers a pair of division. In the first, we support Beforethedaystarts. Charging far too early and forced to stay outside, Beforethedaystarts hung tough and gained attempting to find the top spot before flattening out. Still she finished only 2 lengths off the leader for the fourth check. In chapter two that night, Weekend Update may not be your first choice but could be a good bet as your second and even third. These are short fields so don’t expect outlandish odds on any gal. The $78,400 Four Leaf Clover Final on March 17 can produce an upset if last week’s trip from Art Z can be interpreted as a choice mile. 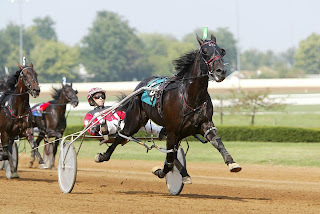 The pacer went first up for Ron Pierce and finished fourth at 11-1. The two public choices were at the wire together in that one, setting up a scenario that could pit them against one another again in the stretch. With a kinder, ground-saving trip, Art Z could be right there to pass them and get to the wire first. Last week the early choice to sweep the Overbid, Higher And Higher, was ignored after losing the first leg and went off at 12-1. That was a major mistake by the public, still enamored by the likes of Put On A Show and Anndrovette, as Higher And Higher stormed to victory. There is no reason to feel she will not win again, though asking anywhere near that price would make you fit for a straightjacket. Even though lightning won’t strike the toteboard twice, Higher And Higher may not be the favorite, making her a precious second or third choice. Four Ron Burke-trained mares will again contest the strength of Higher And Higher and for exotic purposes, though she be coupled, Fred And Ginger should be the prime reason to use the entry. If Tea Party Princess goes as a separate entity, she could finish a triple play, though I would criss-cross the place and show elements. The March 16 no-takeout Pick 4 at Cal-Expo brings together four groups on the Friday program (this time we have the correct four races on the correct date). (4) Indelible left no particularly sharp impression with his third-place finish last week but we have to ignore that in lieu of strong support at the windows. (10) Precious Few is the key to opening this exotic with a huge price. Last week he made two powerful moves in contention through the mile, being wide to start for the lead, ducking and coming out again later to be hung challenging to regain the top. This was the performance of a horse let off at 53-1, so the post tonight does not frighten me. (6) Jane The Brain was the only one in this group to show forward motion in her most recent effort and on that alone gets the nod. Two strong comebacks loom boldly in this field. (7) Code Blue raced a hole in the Sacramento wind last week, making up humungous ground without major collapsing on the front. As well, (8) Barona Hickory won with a first-over move that did not cause any loss of ground in the end. (5) Wrangler Reward has been threatening a major win of late and was all out last week with a strong start. Unfortunately he had to use that speed while in the second tier and that cost him the first two spots. Hanging on for third in a race where he was hanging badly, however, is impressive, no less at 7-1.